Welcome to my Ol’ Kentucky Home! If you are visiting from the Summer Tour of Homes…WELCOME! 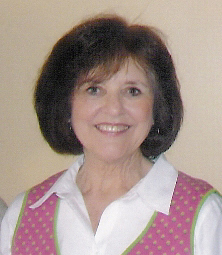 You may be coming over from my sweet friend, Rhoda’s, house. Wasn’t it beautiful?!!! She is truly amazing! Have you been enjoying the tour? I have visited every home, every day, and have enjoyed it so much! I am so honored to be a part of this tour. We have lived in our current home for exactly two years. It was a 1400 sq ft ranch that needed a lot of updating. Here is what our kitchen looked like before we got our hands on it. My husband and I renovated our whole kitchen top to bottom, and we are so pleased with our new kitchen. It doesn’t even look like the same space. To see more of our kitchen renovation, click HERE and HERE. The above picture was taken the day before Christmas, but I have also had fun dressing my open shelves up for other seasons too. Another room we have renovated in this house is our guest bathroom. It was a green, outdated mess! 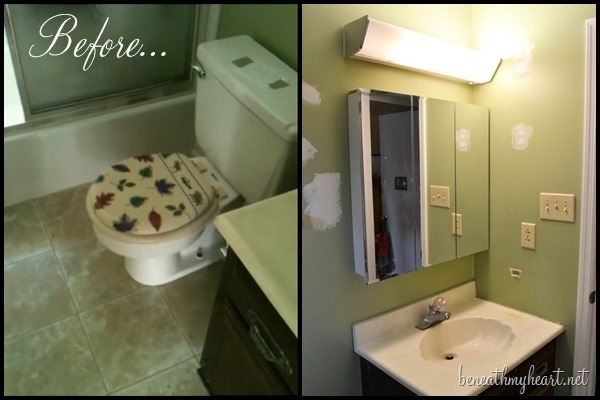 We gutted the whole thing and created a new guest bath with the cottage feel that we love. To read the details about this renovation, click HERE and HERE. My handy husband also built this beautiful butcher block vanity for our bathroom. You can read about how he built it HERE. 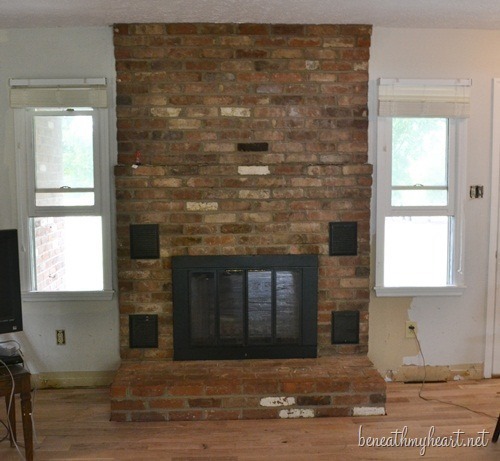 Another area of our house that definitely needed updating was our fire place. 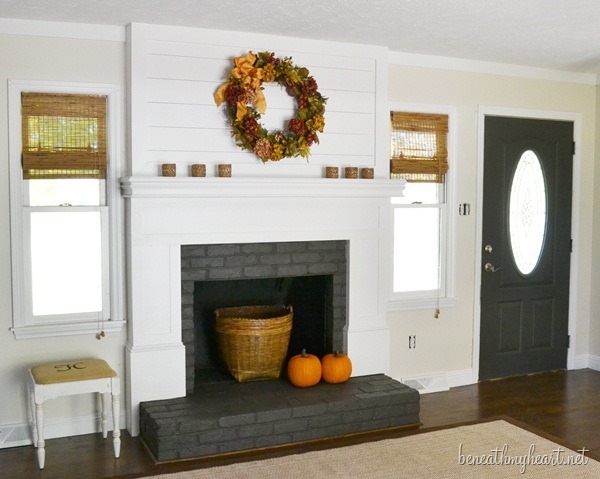 Last fall, my husband and I built a new surround for our fireplace. You can read about how we built it, HERE. One of my more recent renovations is my craft closet makeover. I love this new space! It feels so good to be more organized. You can see how we created this space HERE. This craft closet sits in the room that will become my new office. You can see the beginning of our custom built office desks HERE. A few months after we moved into this home, we started building an addition to the side of our ranch. It is a two story addition. I love the new newel post that my husband built for our staircase. You can read about how he built it HERE. The door you see behind the stairs leads to our master bedroom. This is the biggest room our the house, and I love it! It’s like our own little retreat. Our dog, Champ, loves it too. He loves to lay on our bed and soak up the sunshine that comes through the windows. We still have more work to do on our master bathroom, but it’s getting there. You can step inside our bathroom through the antique wood door that we got for free! I absolutely love this door. You can read about how we refinished it HERE. We also refinished an antique dresser and turned it into our vanity. You can read about that transformation HERE. And I LOVE our faux wood beams that we got from AZ Faux Beams. You can read about how super easy they were to install HERE. 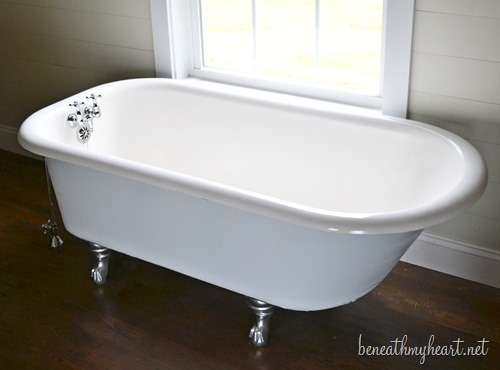 We found this antique claw foot tub off of Craigslist, and my husband refinished it. You can read about how he did it HERE. 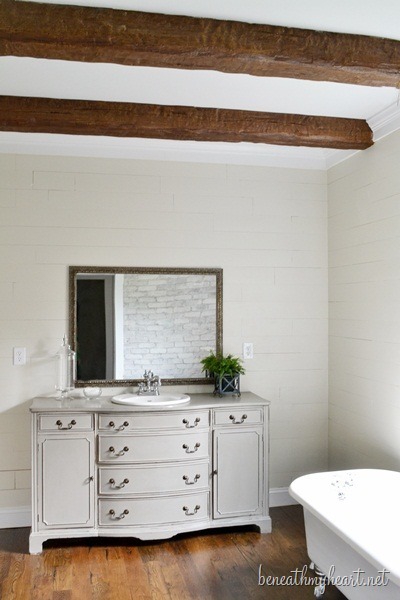 Since our master bathroom is part of our new addition to the house, we decided to white wash the exposed brick that was once the exterior brick of our original ranch house. You can read about how we did it HERE. We live on 5 beautiful acres with a very secluded back yard. We still have some work to do outside, but we have been enjoying our back patio. Do you see that little guest house in the background of these pictures? That is what made me fall in love with this house two years ago when we bought it. We haven’t renovated it yet, but when we do, it’s doing to be awesome! 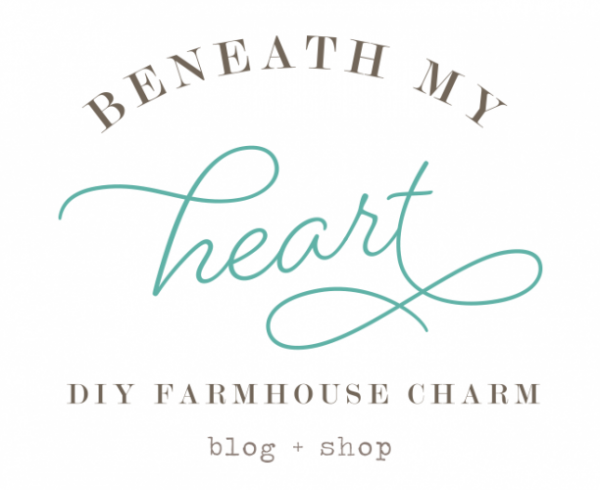 I hope you follow my blog so you can share in that fun little adventure. This arbor was already built when we moved in, but we added the swing that my dad made for me. 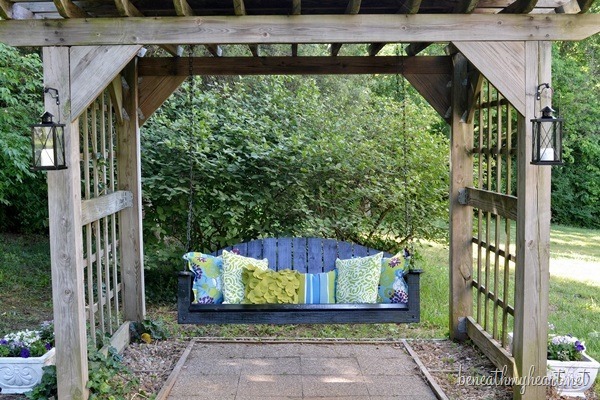 We love sitting in this swing in the evenings and enjoying the peacefulness of our home. Yep! Chickens! 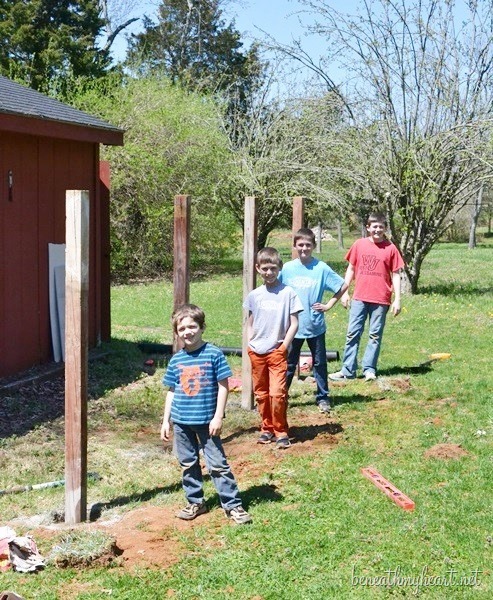 My four boys helped their daddy build a coop this past Spring. 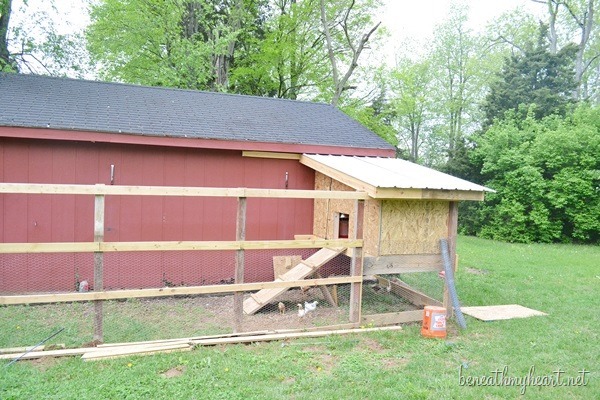 The chickens love their new coop, but I hope to make it a little prettier someday soon. Anyway, that concludes my tour of our Kentucky Home! Thank you for stopping by! If you would like to take a tour of our previous home, just click on the picture below. And here are the rest of the homes on the tour if you want to check them out! Amazing, Traci! Every detail of your renovation is just beautiful. You and your husband are very talented. Thanks for providing such great inspiration. Your hard work has certainly paid off. Just gorgeous. Love your quilt on your bed. I found one like it at an antique mall very cheap. It it a bit tattered, but that’s okay. Traci, I was just here recently wishing to find a whole home tour. I’m absolutely astounded at all y’all have done in what seems like a very short time. Everything is so light and bright. I love it! I’ll be studying these pics. Love, love, love your house, Traci! 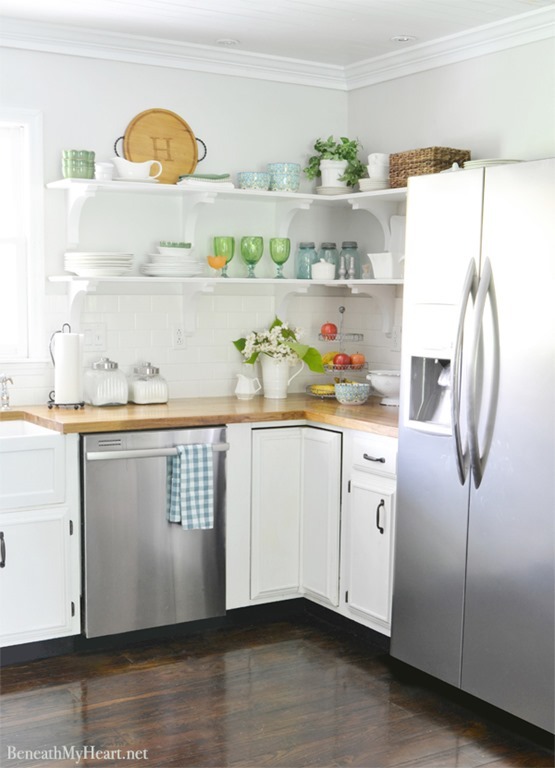 Your kitchen remodel is such an amazing transformation! I am blown away by all the beautiful changes you’ve made! Love your home! So much hard work but it is completely gorgeous. 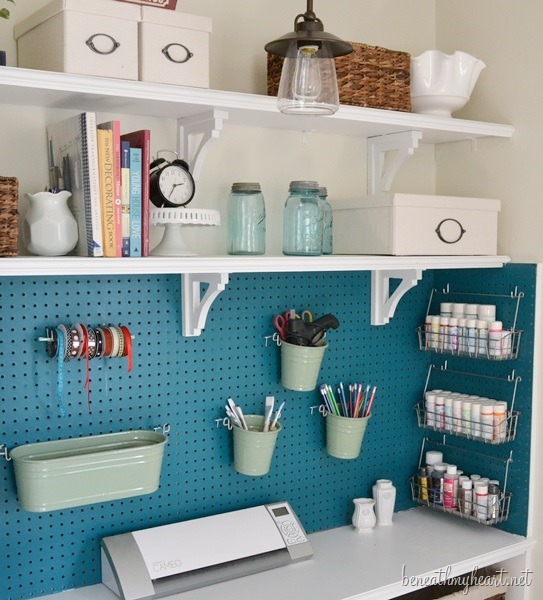 I have drooled over your craft closet makeover before and enjoyed seeing it again. I was finally able to show my husband my idea for pegboard in my craft room. Seeing is believing huh? At least around here it is! Thanks for sharing and best of luck! Oh Traci, I so adored your tour! The woodwork and rustic features you have brought into a new home renovation make it so cozy! 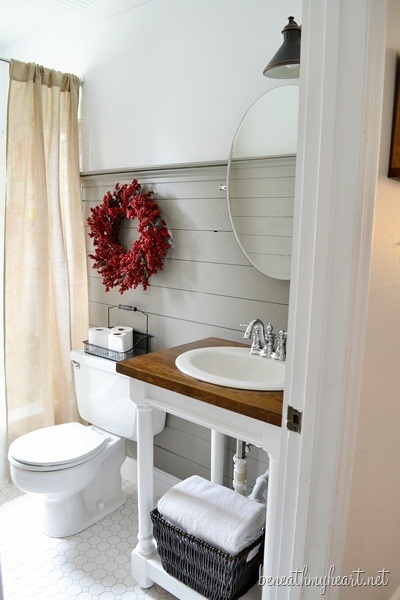 I can’t even really pinpoint a fav… from the reclaimed door on your bathroom, rustic beams, woodwork on the walls, butcher block vanity, it’s all so stunning! You two make an AWESOME DIY team! Thanks for the peek in! Um, so… I love EVERYTHING in your house. Can I has it? ;} Seriously gorgeous, Traci. LOVE LOVE LOVE! It looks beautiful!! I’m so glad it’s all finally starting to come together!! Me too! Thanks for all the help in cleaning it. :) YOU ARE THE BEST SISTER IN THE WORLD!!!! 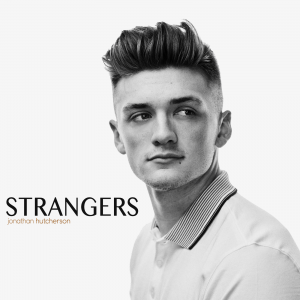 OK..you have me hooked. 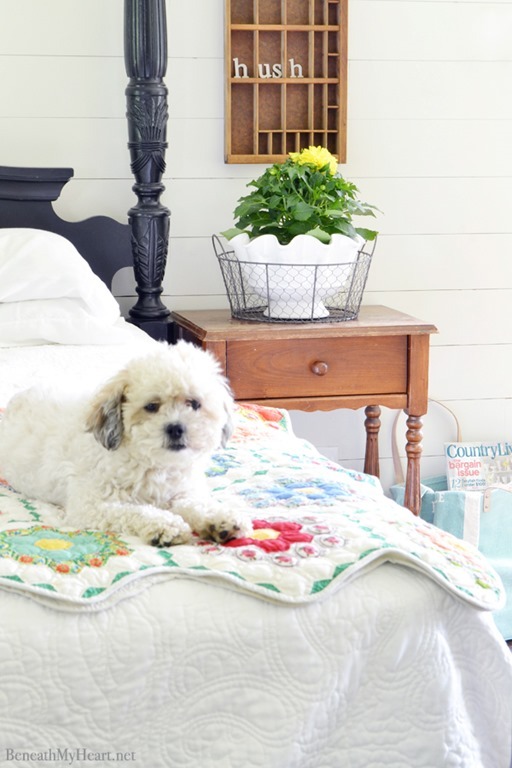 Love your style–cottage with some farmhouse. Planked walls, comfortable, inviting…then I see the little house out back. I have to see that reno! The clincher? The chickens!!! You are now on my morning blog check in! We moved from 64 acres on the top of a mtn. 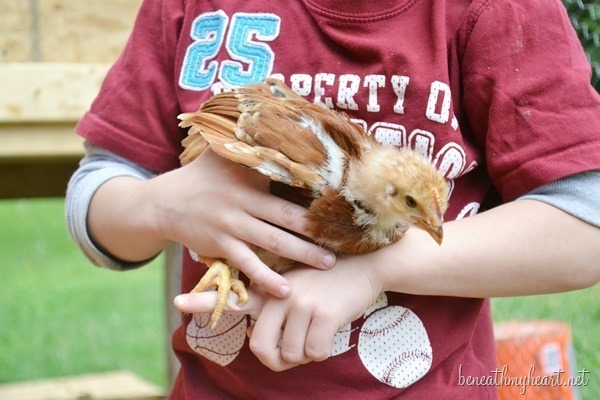 in VA, with 25 chickens–soft spot in my heart. Can’t wait to see what you do. I love your bedroom, guest bath…simple without being overdone/overdecorated! Traci, your home is lovely! I love what you did to your fireplace. 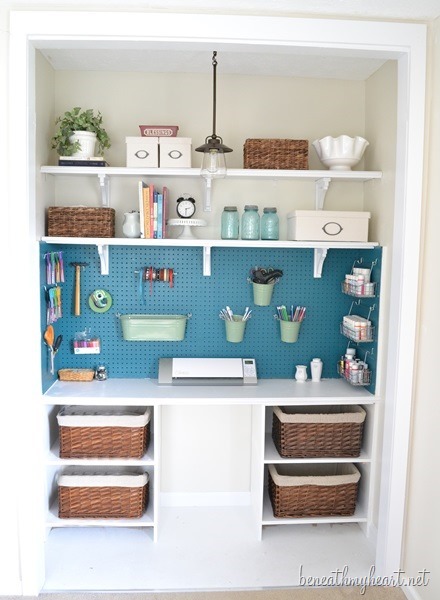 The craft closet is so pretty – love it! 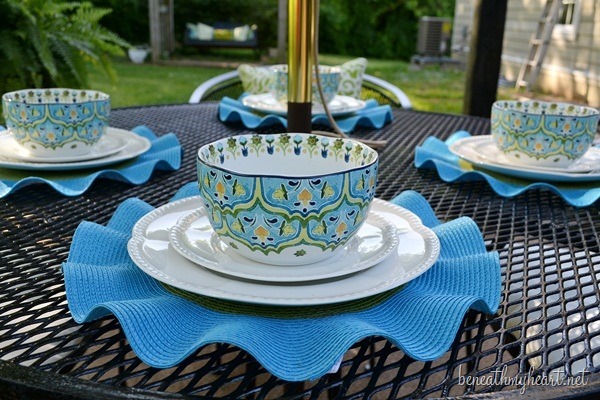 I have to know where you got your fluted placemats? You and your husband are very talented DIYers – thanks for the tour! Hi Traci! 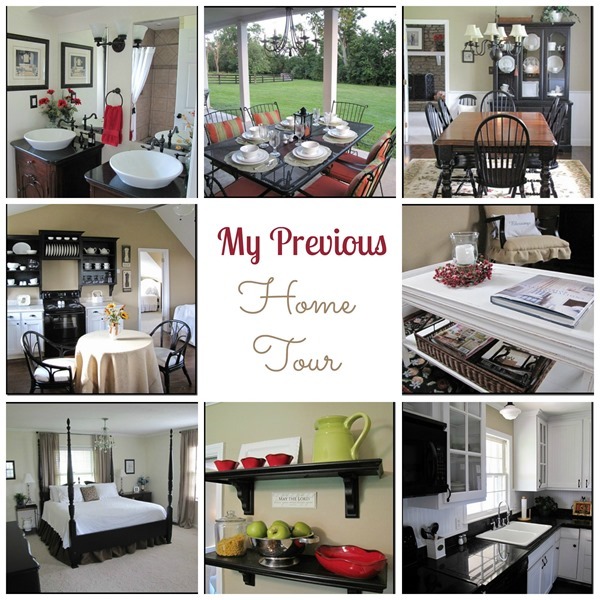 I just found your blog via the home tour and I absolutely love it!! 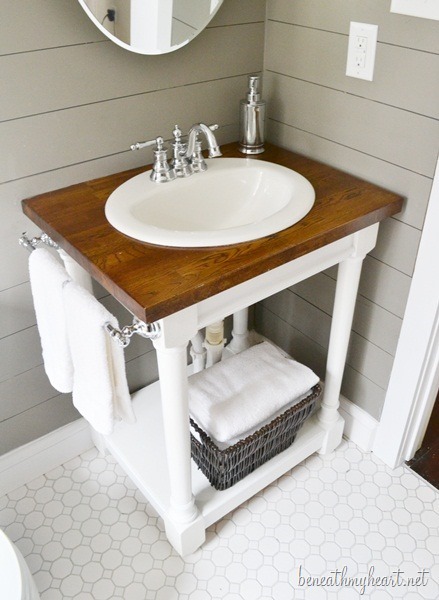 That butcher block sink and re-done dresser-vanity are to die for. I’m excited to have found your blog. While I live in Ohio now, I’m originally from Kentucky-which is of course where my heart truly lies. :) Thanks for sharing! Traci ~ Love your house and your decorating style. You make everything look so clean and refreshed :) Couple questions: Do you have a shower in your master bathroom. do you take baths in front of that uncovered window and will you share how you and your hubby finished your stairs? 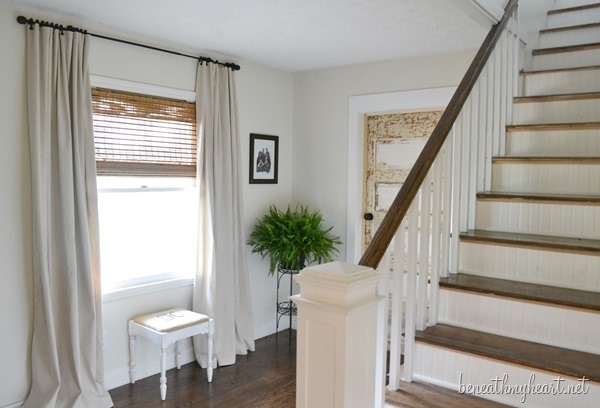 I’m hoping to redo my carpeted stairs soon and love the bead board style of your stairs. Love your home Traci! Love your guts! your home is gorgeous! 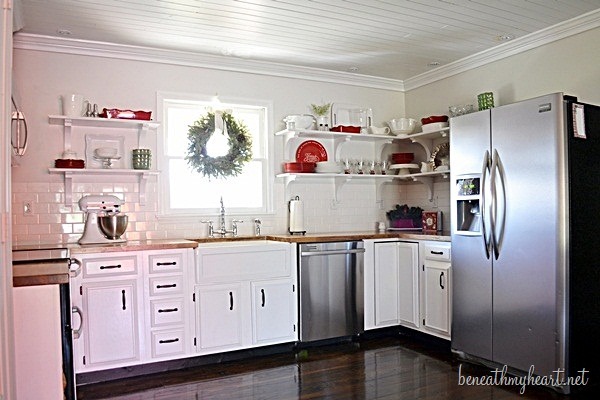 i love the mantle/fireplace and the kitchen shelving! 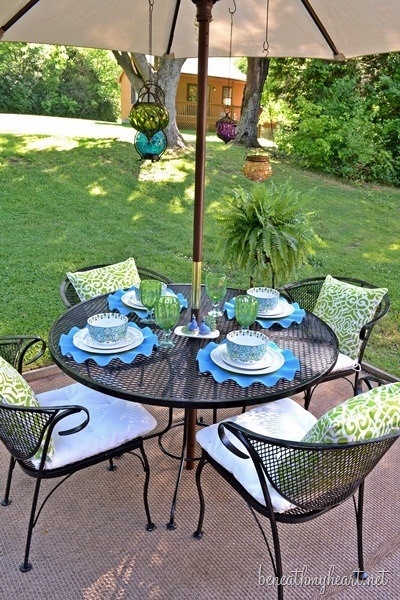 the summer colors suit your home beautifully! Love love love your whole home! I just love all the unique touches and character you added. 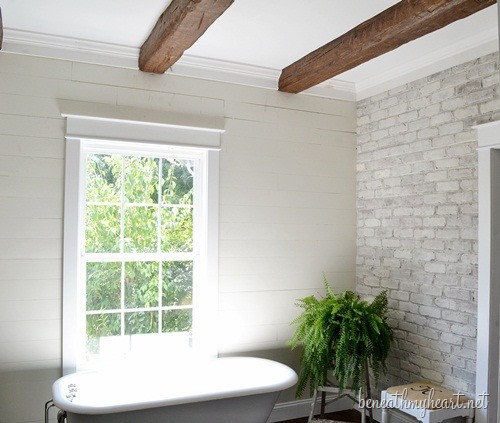 Seriously jealous of that brick wall in your master bath, so cool! Everything is so lovely Traci!! All of the renovations that you guys did are amazing!! 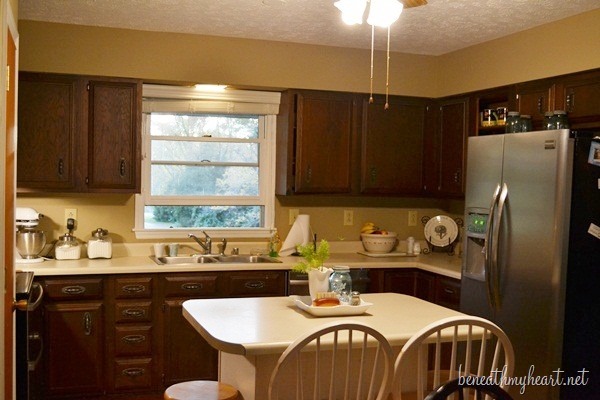 Your kitchen before and after photos just blew me away! I’m so glad I got to stop by and visit your beautiful home! Everything is beautiful! Looks like you’re about ready for a real life open house! Hi, I came across after Rhoda’s tour who I followed throughout her renovations. I love your cottage, country style, I have very similar taste but live way, way away in New Zealand. Your kitchen makeover is fabulous, I am looking at renovating mine, which is actually very modern it was updated by the previous owners but I want to add a lot more storage and some character to what is a clinical white and stainless steel kitchen. I might just take some ideas from your kitchen, especially the open shelving. I love your house, your little dog (I have a smaller grey version, Poppy), hope you get a chance to visit my blog. I will stop by your blog. Thanks for the invite! Aaah, thank you, Erica! I know how time consuming it can be to leave comments, so I feel extra honored that you left one for me. :) I appreciate your kind words. Our house is a work in progress, but it is finally starting to slowly come together. You have a beautiful home, Traci! 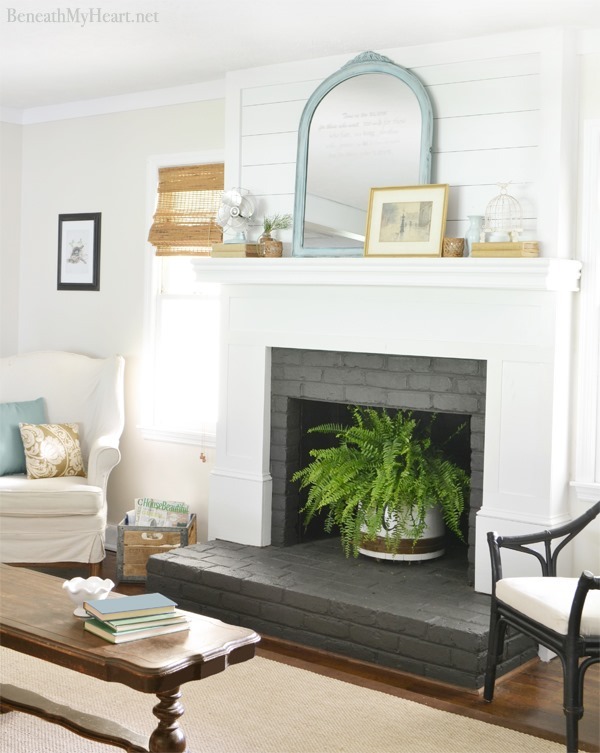 I adore all the special touches you’ve given it… the beadboard ceiling, the brick, the beams. So much inspiration! Oh my goodness, Traci! Everything looks gorgeous! LOVE how your kitchen and fireplace looks decorated for summer. Just pinned them both! You home is beautiful. Y’all are so talented, love all the DIY projects. Love your style. WOWOWOWOWOWOW… i do follow your blog… But somewhere along the line I missed out on some things……………… see ALLLLL … the progress is amazing!!! The Master bedroom and bath is gorgeous with a capitol “G”!!!! 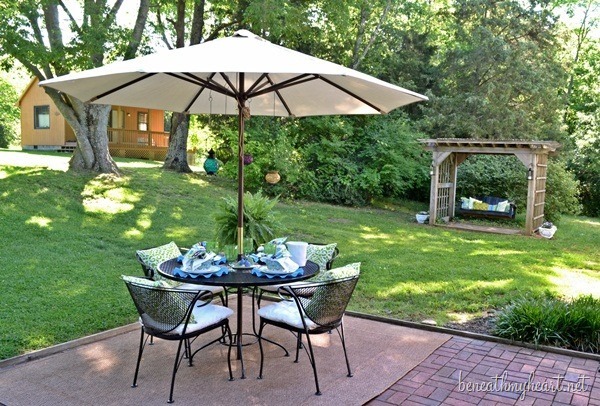 Loving the backyard area as well!! Thanks for sharing Traci!!!!!!!! Such a nice touch you have for decorating. Neat what you guys have done. What a treat to see what you have created and put together. Delighted to visit your place today. Will have to come back when I can visit the other sights. You are greatly loved by a great God! 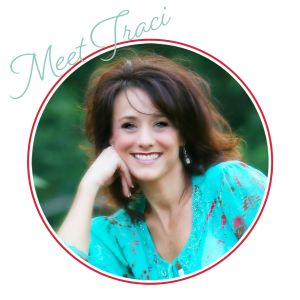 What a fun post, Traci — great to see all your progress in one place! Hope you have a lovely weekend! Your home is so cute! I am loving your master bath and can’t wait to see the rest. I love how your kitchen changes with the seasons. Would you mind sharing where you found the light in your master- LOVE IT! That is from Ballard Designs. :) I got it last year on my trip to their headquarters. I love it! One of the most beautiful and creative homes on the list. Thanks for sharing! 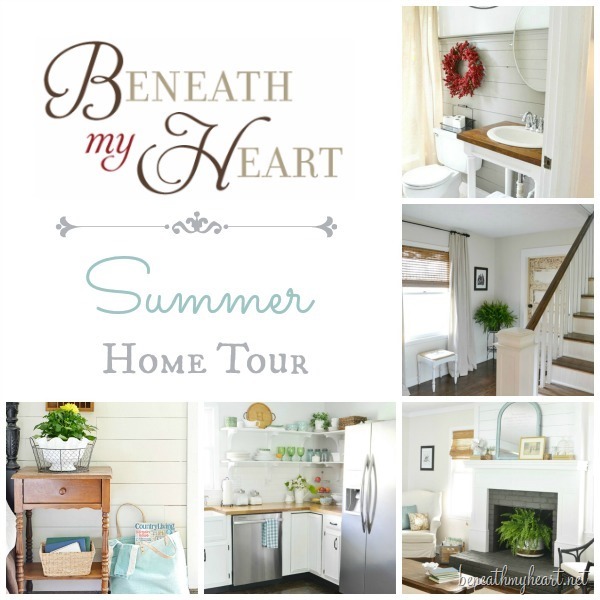 Your home is my favorite on the tour so far – I love all the white and the farmhouse look. Must be my Kentucky mama’s influence on this Virginia girl! 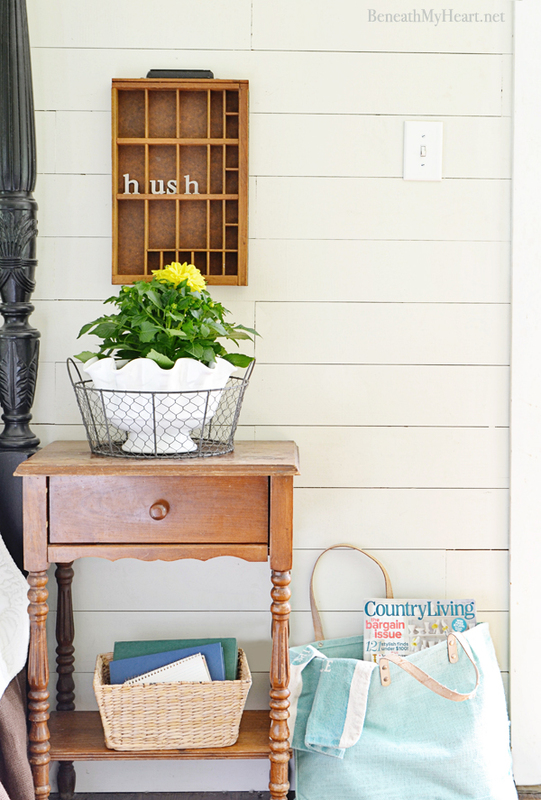 Is that my favorite Pier1 scalloped serving bowl I see being used as a flowerpot? And yes, that bowl is exactly like the ones at Pier 1, but I scored mine at Marshall’s. Thanks for stopping by! Come back and see me. I absolutely LOVE your home. You and your husband have done an amazing job redoing it to a dream home. The plank walls in the bedroom are wonderful and all that light streaming in is heavenly! Thanks for giving us a tour of your lovely home! wow. I really love your home!! one of my fav homes so far – so simple and elegant, relaxed. I have 3 boys and it seems like we could live there! I do have a question if you get around to it — or if its not on your kitchen post which is where Im going next. 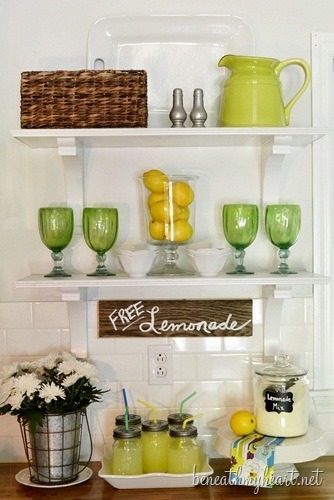 – Where did you find the kitchen shelf brackets? or did you make them? thanks a mil! We bought those corbels at the Home Depot. Loved your home tour. We are considering doing planked walls in our den / family room. What product did you use for your planks? I really like your house. One of my favorites!! I had been wanting to see your house and finally got to. I luv what you did with the fireplace. Now I know there is hope for my big red brick eyesore. Thanks so much for sharing your gift of talent with us. Traci, your house is gorgeous!!!!! I like it best now with the subtle aqua blues. Going back now to pin a few pics! It’s not easy to inspire me, but you did! Thanks for sharing! I love your house! It’s so bright and cheerful! You did a wonderful job on the makeovers, I don’t know which one is my favorite! beautiful home – I love love LOVE your master bathroom… very well done! Thanks for sharing! How did I not see this before? Your home is beautiful. I love the fireplace redo. We have those same heat-ol-ator vent things. What a fabulous idea to cover them up. I’ll let my husband finish up our next few projects before I spring that on him. Beautiful home. 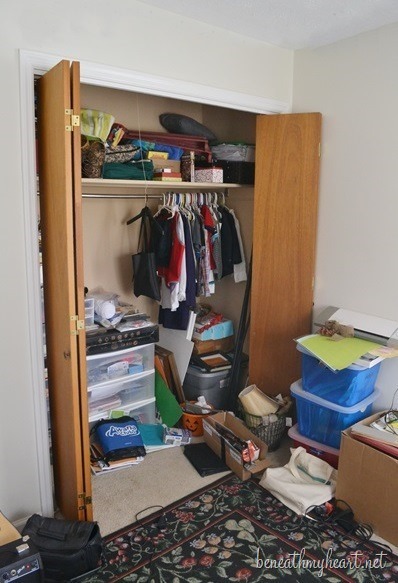 Your Craft Closet is AMAZING! really creative, and looks beautiful and makes use of the space . Wow! I love your swing, fireplace, and white-washed brick!!!! Your house looks amazing, I love all the shelving you have all over the house, it makes your house well organized. Great job and nice house as well.